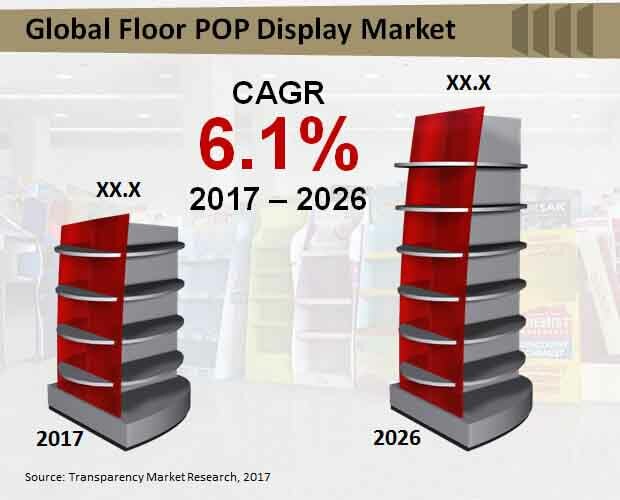 The global floor POP display market has exhibited an upward trend in recent years and this is likely to continue beyond 2017. Floor POP displays are emerging as an effective product merchandising solution in modern retail stores, supermarkets and hypermarkets. The aggressive marketing strategies implemented by brands for reaching out to consumers has led to development of various types of POP displays. Brands are allocating more budgets to their marketing departments, especially for new products, which is creating a need for innovative merchandising solutions. According to a recent report published by Transparency Market Research (TMR), the global floor POP display market is set to soar at an above-average CAGR of 6.1% during the forecast period (2017-2026). Preference for POP display among companies that are engaged in manufacturing and supplying of consumer goods (grocery, food, beverage, electronics, etc.) is significantly high. Floor POP displays are extremely effective when it comes to expediting product visibility. It is observed that floor POP displays are appealing more to the millennial consumers. Such displays are allowing brands to make the most out of the limited-timed engagement from young consumers with a product in retail outlets. At the same time, POP displays are more convenient for consumers as they give an instantaneous visibility to a product along with information and latest offers. Floor POP displays convey accurate information regarding a product and enable brands to remain consistently in vision. This, in turn, has made it popular in hypermarkets, supermarket, departmental store, specialty store and convenience store. Development of organized retail outlets particularly in emerging economies is anticipated to reflect favourably on the market. Floor POP displays are easy to recycle and thereby have a higher preference as compared to other merchandising solutions. However, factors such as limited reach, changing consumer perception and product orientation is likely to impact the floor POP displays market during the forecast period. North America is anticipated to retain its predominant position in the global floor POP display market in 2017 and beyond. In terms of revenue, the region continues to make major contributions to the global market. During the forecast period, the North America floor POP display market is projected to exhibit a CAGR of 5.7%. Meanwhile, regions such as Europe, Asia Pacific excluding Japan (APEJ), Latin America, Japan and the Middle East & Africa (MEA) are also expect to witness a considerable rise in product merchandising through floor POP displays. Most brands show are higher preference for corrugated board based floor pop display owing to their superior functionally and high convenience. Global sales of corrugated board based floor pop display currently command for nearly 62% market share in terms of revenue. Towards the end 2026, more than US$ 3,400 Mn worth corrugated board based floor pop displays are estimated to be sold worldwide. Plastic sheet based floor pop displays are also expected gain further popularity during the forecast period. By 2017-end, global sales of plastic sheet based floor pop displays are estimated to account for a sizable revenue share of the global floor POP display market. Top companies operating in the global floor POP display include Sonoco Products Company, DS Smith Plc, Smurfit Kappa Group PLC, Georgia-Pacific LLC, WestRock Company, FFR Merchandising Company, U.S. Corrugated, Inc., Marketing Alliance Group, Creative Displays Now and Pratt Industries Inc. This report studies the current trends and future prospects of the global market floor POP display market. In this report, the reader will first of all come across an executive summary, which offers snapshot of the market along with information regarding key segment and sub-segments. The data provided in the research report is derived from a combination of secondary and primary sources. Secondary sources include annual reports, company websites stock analysis presentations, press releases and various organizational databases. Primary research resources involved information gathered from interactions and telephonic interviews with market observers and company executive. The readers will come across information related to market size (based on US$ Mm) for each segment and sub-segments for the period between 2017 and 2026, by analyzing the micro and macro socio-economic factors. Growth rate and performance of each market segment has been evaluated by thoroughly assessing analysis of demographics, past trends, future trends, developments and the regulatory landscape. The report offers an in-depth analysis of the key factors responsible for shaping the dynamics of the market. In addition, the reader also gain excess to information about key opportunities, trends and restraints that are likely to influence the market. The valuation of the market has been offered in terms of US$ Mn along with the compound annual growth rate (CAGR %) from 2017 to 2026 for all the segments in this report, keeping 2016 as the bases year. A thorough analysis of each market segments enabled analysts to make clear-cut projections. Region-wise, the floor POP display market been segmented into five major regions: North America, Europe, Asia, Latin America, and Middle East & Africa. The report offers information on market size and forecast for major countries in the respective regions. Analysts have conducted an exhaustive analysis on major factors influencing the market in these regions. Further, the report include a market attractiveness index, value chain analysis, market share of key players and pricing analysis, thus presenting a holistic view of the overall competitive scenario in the global floor POP display market. In this section, analysis on the market’s competition landscape has been carried out. Leading market players have been profiled in detail. Information pertaining to key developments, product overview, company overview and key financials has been provided in this section of the report. This section delivers a complete view of the competitive landscape of the global market for floor POP display. An innovative and effective research methodology is leveraged by analysts at Transparency Market Research (TMR), for reaching concrete conclusions associated with the global market for floor POP display. The data offered in the report has undergone multilevel validation process, which has carried out using advanced tools for relevant insights on the global floor POP display market.